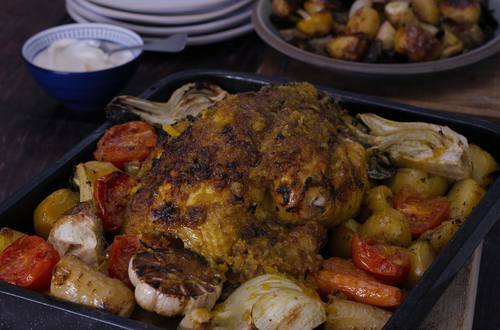 This is a snazzy, summery take on the classic roast chicken. 1 For the chicken, mix together all ingredients apart from the bird itself, then in a baking tray, rub the chicken with the ingredients mix and close it with cling film. Leave it to marinade for 12 hours. 2 Afterwards put the vegetables into the baking tray, pour olive oil, salt and pepper and put in the oven at 170 degrees closed with foil paper. 3 Once the chicken is soft, remove the foil paper, pour the remaining sauce from the baking tray and cook it at 200 degrees until golden. 4 Carve and serve with Hellmann's Real Mayonnaise for a creamy finish.